Each author/publisher has their own idea about what material to emphasize and what approach to take, so you should purchase several different CompTIA Network+ certification study guides. Another advantage to using several different study materials is that they reinforce each other. The first thing you want to look at when selecting study materials is the copyright date. Networking technology changes at a rapid rate, so you don't want to purchase study materials that date from say, 1999. In fact, I wouldn't want to be using materials older than about five years. Another important thing to look for is the number of the exam that the study materials are designed for. 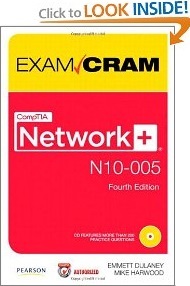 The current CompTIA Network+ exam is number N10-005, which was released Dec. 1, 2011. But when CompTIA releases new exam requirements, the previous exam stays in effect for eight to ten months before you need to study for the new material. Also only a portion of the new exam requirements is new material, the vast majority of it is a repeat of the previous exam requirements, so you can gain a lot of valuable knowledge from studying older exam preparation materials. As I stated earlier, one way to prepare for, and pass the CompTIA Network+ exam is to take practice exams. After each practice exam see which questions you missed, study the related material, and retake the practice exam. Take more practice exams, study more material related to the questions you missed, until you have the confidence that you can take and pass the actual exam. To follow this method, you should give preference to study guides that include a CD ROM containing self tests. 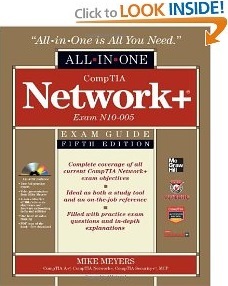 CompTIA Network+ Certification All-in-One Exam Guide by Mike Meyers gives you complete coverage of all the material included on CompTIA Network+ exam with learning objectives at the beginning of each chapter, exam tips, and practice questions. Mike Meyers has a unusual ability to explain things so that they can be easily understood. He also gives you an excellent introduction to networking, so if you're just getting familiar with computer networking this is the study material you need. This book includes two full practice exams, an hour of video training, and a collection of Mike's favorite shareware and freeware networking tools and utilities. You'll find lots of other Mike Meyers CompTIA exam preparation material available, it's all written in his easily understand method, and it's all good. Emmett Dulaney and Michael Harwood's CompTIA Network+ Exam Cram is another exam preparation material that I would recommend. The book covers every exam topic including substantial new coverage of security and wireless, along with practice questions for every exam topic. But you'll mainly be interested in the companion CD which includes the Pearson IT Certification Practice Test engine, complete with hundreds of exam-realistic questions and two complete practice exams. The assessment engine offers you a wealth of customization options and reporting features, laying out a complete assessment of your knowledge to help you focus your study where it is needed most.